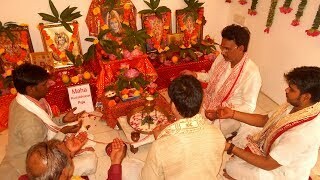 By performing this Puja, a person can get a grip over Health, Wealth and Happiness. He is secured from all kinds of Evil effects and Enemies. His relations with all those who are near and dear to him are improved and amended as well. He gets peace of mind and also attains upgraded spiritual level. According to our Ancient Texts and Scripts, Sri Rudram is the primeval Vedic hymn of assorted names of Lord Shiva. Different aspects of Lord Shiva are invoked and worshipped through the chanting of Sri Rudram. When a fire ritual (Yagna) is carried out following the chanting, it is called as Rudra Yagna (Homam). This is one of the most dynamic Puja for those who are seeking the blessings of Lord Shiva for getting relief from any kind of problem and who want to fulfill all their desires with precious Lord Shiva's blessings. Lord Shiva is the 3rd deity in the Hindu trilogy, accompanied by Lord Brahma and Lord Vishnu. He is the demolisher of all evil, and the one who bestows the greatest blessings when impressed. The sacred month of Shravan is solely dedicated to Lord Shiva and performing this Puja and Homam during this month is considered to be most fruitful. Swasti Vachan, Shanti Path, Sankalp, Ganesh Sthapan, Lord Shiva Sthapan, Lakshmi Sthapan, Varun Kalash, Punyaha Vachan, Navgraha Sthapan, Brahma Sthapan, Agni Sthapan, Invocation of all Gods and Goddesses, Navgrah Mantra Jap (1 mala for each planet), Shiv Rajopachar Puja, One hunderd twenty one ( 121 ) Path of Rudra with Chamkam, Lord Shiva's Abhishek (Archana) with 1008 Bilva Patras (Shiv Shastranam Archana), Homam with Ghee, Sugar, Til, Oats ( Jow ), Ashtagandh, Sandalwood powder, Navgrah Samidha and then Aarti, Tilak Mantra, Prasad to Brahmins. The exact Date and Timings of Maha Rudrabhishek Puja & Yagna will be informed to you through an email and your representatives are most welcome to attend the same.